Going green might invoke images of hipsters in electric cars, but Stephen J. Payne is sure to shatter those with giant lumps of metal. Using reclaimed metal from several salvage yards in the Downtown Los Angeles area, Payne crafts some of the most interesting heavy metal clocks you’ve ever seen. Super-sleek, steel hands and surprisingly, simple designs that would make Howard Roark proud are the hallmark of his collection, which you can help support on his kickstarter page. For as little as $30 you can score his smaller desktop clock, or you can pledge a higher amount for some heavier metal. Make a statement in time and support small business all at once. 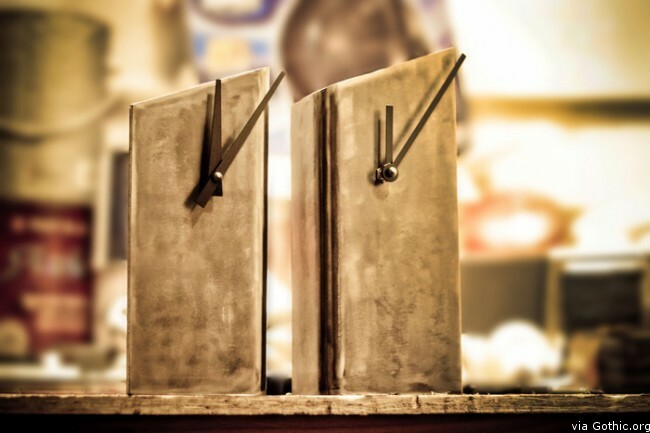 Beautiful clocks made from big lumps of reclaimed metal. This Kickstarter will enable me to build a small, safe production line in my Downtown LA loft. Right now I have the space and I can make one or two at a time, but I need slightly better equipment to make many more. The metal comes from various metal salvage yards just south of DTLA. The clock mechanisms are the standard quartz movements you find in just about every clock on the planet. Right now I’m making a few clocks in my small workshop/storage area, but the hand drill and hand saw are barely adequate and probably not that safe. To make these lovely timepieces properly, I need to upgrade a little, hence the Kickstarter. The good news is that I’m already making these clocks so I already have the workflow down. The Kickstarter is really for the workshop to be able to do them properly. Posted by Piper Patmore on January 17, 2013. Filed under Decor, Headline. You can follow any responses to this entry through the RSS 2.0. Both comments and pings are currently closed.